Beneteau 473 is yet another Beneteau’s finest cruising yacht known well for its performance, speed and great interior. We provided this client with our custom mattress and mattress pad cover. We make everything to order and can do any size and any shape. 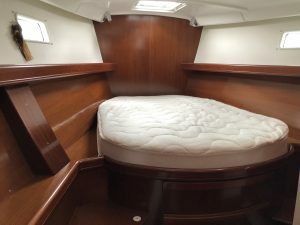 We make mattresses and toppers to fit your individual boat. This client went with our 7” Commodore. The Commodore is our most popular model. It is constructed with a 6″ Latex core and covered in an ultra-soft bamboo quilting. The benefits of a latex mattress include being mold and mildew resistant, extremely comfortable, latex helps regulate body heat, which allows you to sleep cooler and it is bendable and breathable. Available in Soft, Medium Firm and Firm. Latex mattresses are ridged like an inner spring mattress, making it easier to make the bed as well as move it if you need to get the bed on an off the platform. If you like a plush mattress, then our 9” Admiral is for you. It is constructed with a super comfy 6” (medium) Latex core. We then add 2” of ultra-soft latex Pillow Top and cover it in the plushest of bamboo quilting. The result is one soft, plush mattress. Our Captain Hybrid is an economical way to enjoy the comfort of Latex and freshen up your stateroom. We start with a 3” base of hi density polyurethane foam and add 2 inches of soft latex and cover it in our plush bamboo quilting. It’s the perfect choice for guest bunks and crew quarters. With several boat mattress and mattress topper options to choose from, we are able to create a sleeping solution to fit all budgets. Each boat mattress we make is crafted custom in California and built to stand up to rigors of a marine environment. We always recommend our customers to get the mattress pad cover to protect their new mattress. 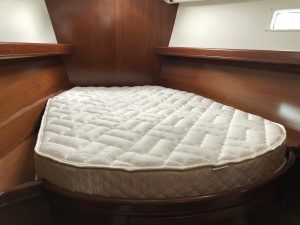 A well fit mattress pad not only protects your stateroom mattress but it helps keep your sheets in place. Our custom mattress pad cover will provide an additional layer of comfort for a perfect night’s sleep & is waterproof, so it will protect your mattress. The image here shows our Tencel mattress pad cover. Feel free to visit our website to view our entire line of products and contact us for any additional info and our design team will be happy to assist you.